Have you noticed that the longer you have your computer, the slower it runs and the more it crashes? 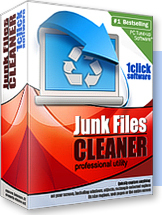 Junk Files Cleaner is a solutions for you! Your hard drive is littered with junk files you don't need, taking up precious hard disk space, and potentially slowing down your PC's performance. There are files of all kinds, such as temporary files that applications should delete when they're no longer needed, various log files, index files, backup files etc. You'd be amazed at how much space these junk files take up. Junk Files Cleaner is already included into All-in-One System Optimizer suite.